I have always valued time to do nothing while I let my gaze and mind wander. I can think of many childhood moments watching rain drops slither across the car window or waking up and staring at a crack in the ceiling or the colored squares on a rug. Maybe you watch the clouds as they slowly morph from one shape to another or follow the patterns of the tiles on the bathroom floor. Our eyes and minds are always trying to find recognizable shapes and patterns, to make some sense of things. It’s the patterns that aren’t quite symmetrical, that don’t repeat exactly the same way that really draw me in. Instead of letting my eyes and mind complete the sequence and move on, they keep me searching for connections and trying to understand. I recently checked out a book of quilts from the library full of many scrap quilts that begin with a pattern but veer off as colors and fabric run out. Or they go wild from the start when the quilter makes use of whatever fabric she has on hand or whims she chooses. 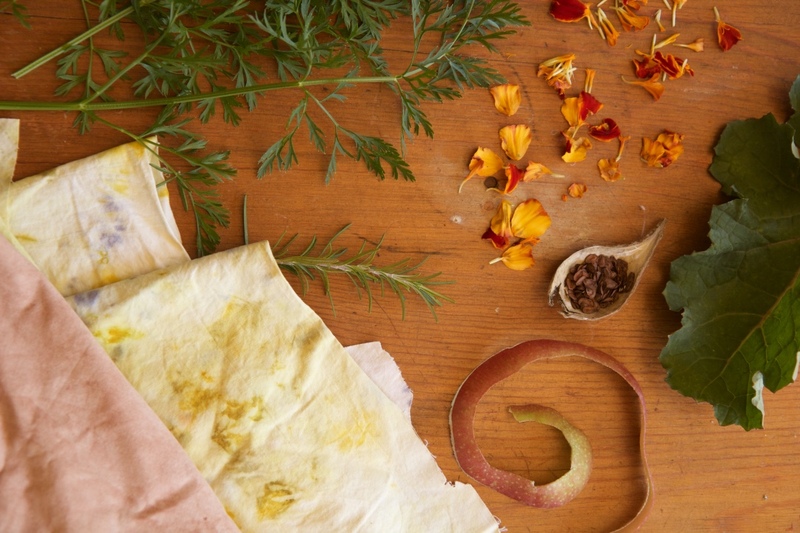 Seeing these joyous acts of sewing, of piecing together scraps and ideas, has reassured me that perfection does not have to be the aim of quilt making. When I make quilts, corners don’t always line up and the edges are not usually even. But the process of choosing colors and patterns from the stash of fabric on my shelf is an experience of joy. 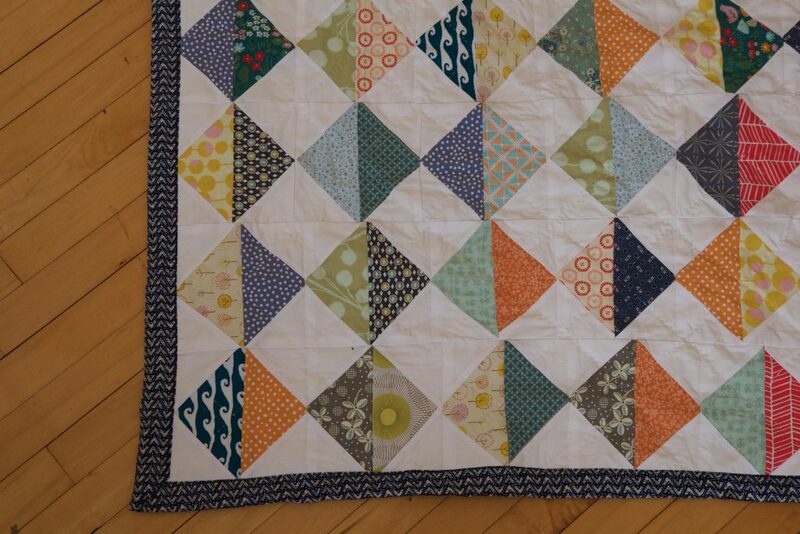 Quilting is one way to turn scraps into something beautiful and useful, an intersection of creativity and necessity. 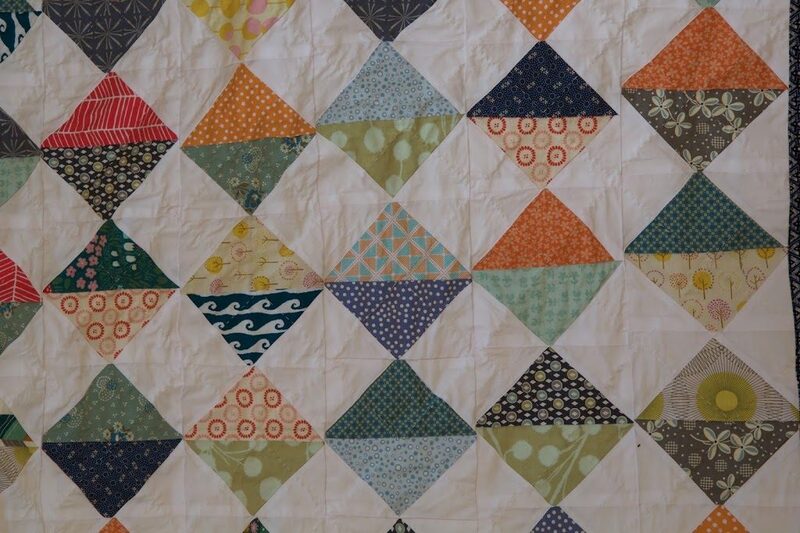 Saving scraps and repurposing fabric to make quilts was practiced most often by women in the twentieth century as an inexpensive way to keep their families warm. Often they didn’t have the time or fabric supply to be picky about patterns and colors. 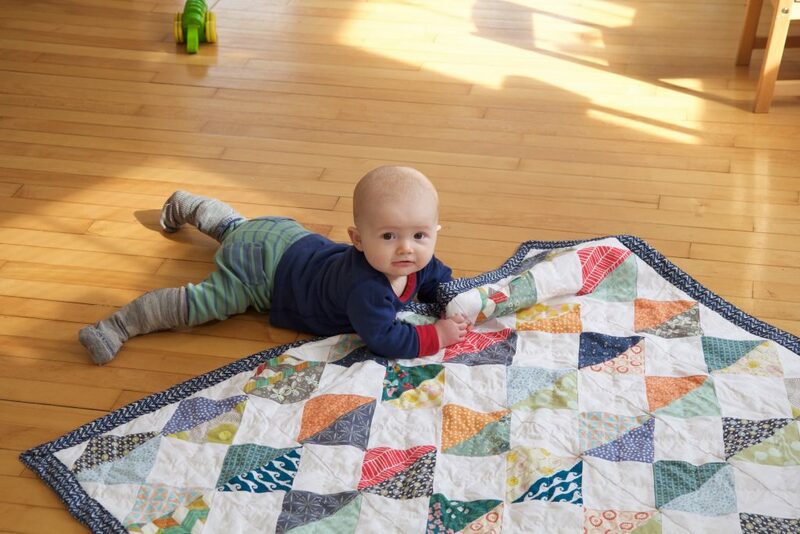 Instead they used scraps of fabric, pieces of old clothes and cuts of worn out denim to create quilts that were essential to their homes and their creative spirits. Beyond using scraps for the top, thrifty quilters have used old clothes, tattered quilts and other materials instead of batting when it wasn’t available or affordable. But the need to cover big beds and keep little toes warm was also a chance to take a colorful break from work and chores and spend time creating. 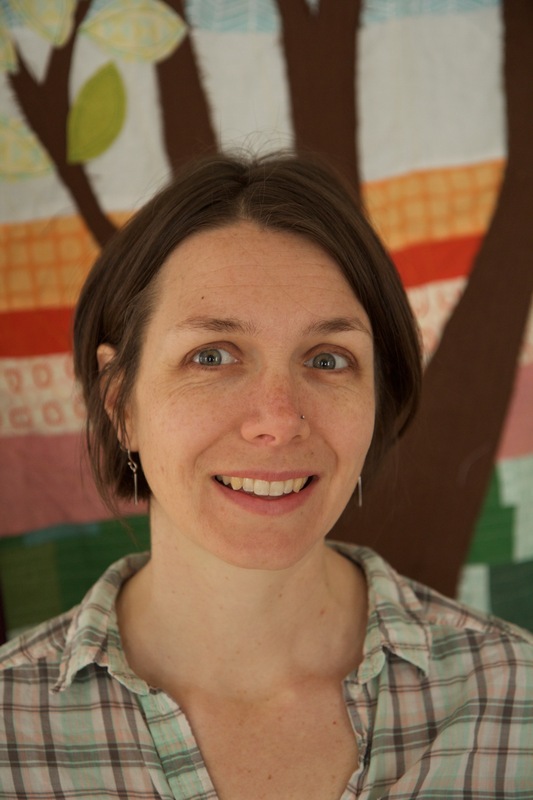 It reminds me of the saying that firewood warms you twice, but instead of the way splitting and stacking the wood warms you long before you burn it, the process of making a quilt is a practice of warmth and joy. When I am done playing with colors and patterns, I love the act of quilting as a way of binding things together. On a winter evening, I spread the quilt on my lap and use stitch after stitch to make three layers into one. 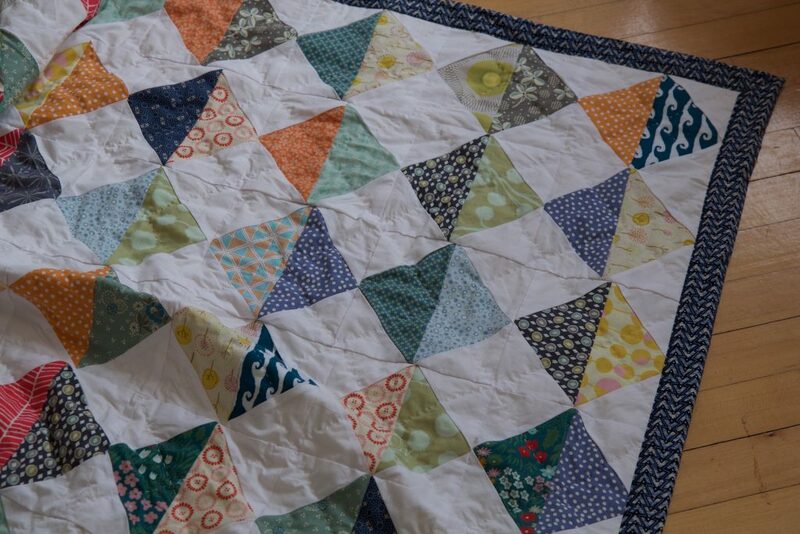 All the cutting, piecing and stitching are as joyful as tucking under the quilt or giving it away. Perhaps it is the uncertainty and chaos of world events, perhaps it is the uncertainty and chaos of parenting, but I am so drawn to creating order and chaos with colors and patterns and to stitching it all together by machine and hand. 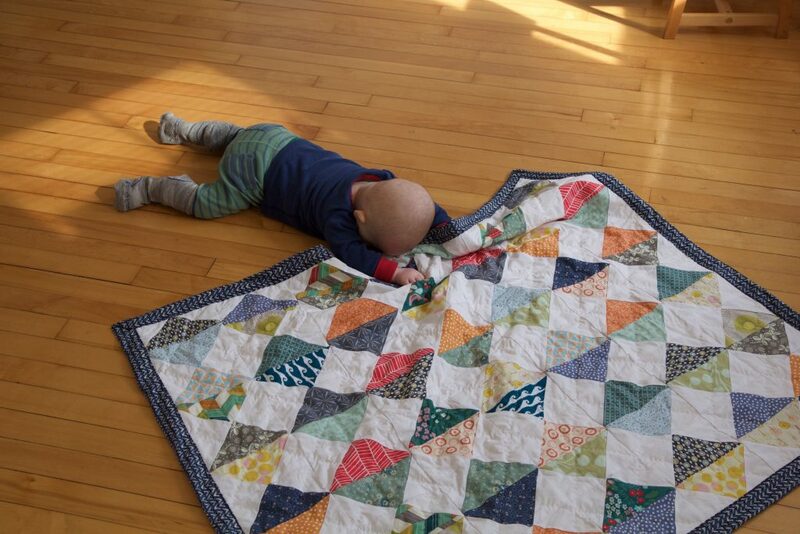 This quilt (with nine month old Eowyn for scale) is for our friends’ baby due in the spring. I started by making flying geese triangles and then decided to make squares instead. I have more fabric and ideas waiting and I keep picturing a stack of little quilts, neatly folded and resting in our living room. That would last about a second before Amos would spread them all around and turned into imaginary boats, buses, or trash trucks. We all have our own ways of finding that joy in creating. I totally agree! There's a kind of dance with color and pattern when figuring out where the scraps belong that soothes the soul. I also prefer stitching by hand now, I feel more connected to the process than when using the machine. More connected to my ancestral sewing sisters and their journies. Thanks for your post!